From San Francisco comes a fresh female artist known as Lisa Star who just released her latest CD “Bare Essentials” (2012) under her own Passion Star Records. This latest release features Star on vocals and Charles Davis on guitar as primaries. All tracks are classic Jazz remakes from the past from artists like Billie Holiday, John Lennon, Burt Bacharach, and Duke Ellington. First a bit about Star: Singing and writing songs that are uplifting, sensual and soul-inspiring has been a life long dream come true. In creating her record label and publishing business, she’s created a team of talent that is bringing this dream to joyful fruition. Let me go on by saying if joy brings depth to an artist’s music then Lisa Star’s music is deep. Her music reflects the simple joys of life but it also soars with hope and that’s what makes her so compelling to listen to. Star has a sound that favors many female Jazz artists yet with a modern-day feel that is timeless and magical. Bare Essentials” captures a very pure and genuine sound that grabs the listener right from the get go. I always listen to the opening track extremely carefully. It’s the opening track the artist has selected to hit your ears first and foremost. The opening track “On a Clear Day” (You Can See Forever) sets the stage rather well for a CD like this. It was a great intro piece that stuck in my head and had me eager for what lied ahead. All in all the whole CD is brilliantly delivered with a richly woven timeless Contemporary Jazz textures with classic songs from the past that have serious staying power. Music will remind you of Diana Krall, Stacey Kent, Jane Monheit, Elaine Elias and Sophie Milman. Guitar from Charles Davis sets the impeccable Jazz standard with an eloquent playing style reminiscent of legendary Wes Montgomery, Kenny Burrell, Joe Pass and Grant Green. If there was one word I would use to describe Lisa Star as an artist and singer it would be “genuine”. This is one lady who launched her own label and musical career based on her passion. The CD will simply make your day more entertaining, but there is an undeniable passion beneath all this that’s even bigger than the music itself. Star is an impressive talent besides being a capable vocalist and performer. Above all it’s obvious to me her primary goal as an artist is to make the world a better place one song at a time. If that’s sounds corny so be it. This CD spoke to me personally and inspired me on so many different levels. We need more artists/people in this world like Lisa Star right away! For 13 years, Lisa Star worked for George Lucas' game division, LucasArts, becoming the company's international business and operations manager. Then, a year ago, her career path took a melodic turn. At an outdoor house concert in Marin, she got bitten. Not by a mosquito or the family dog. The music bug got her. She got so turned on listening to jazz bassist Edo Castro, singer Deborah Winters, percussionist Ian Dogole and other local musicians that she was inspired to start her own independent label, Passion Star Records, based in Larkspur, CA. "I absolutely knew I had to be part of this music scene," she told me. "My passion is music, not games. So I said, 'Hey, let's get a record label together. Let's get some publishing together. Let's put on a show!'" Her first release was a New Age solo piano CD, "Tabernacle," by her partner, Canadian keyboardist Ray Cooper. Now she's come out with her sophomore effort, "Phoenix," a slickly produced CD of ambient jazz showcasing the talents of musician and composer Edo Castro on seven- and eight-string fretless basses. He gets a lot of support from some fine players, among them saxophonist George Brooks, drummer Paul Van Wageningen, electric guitarist Lorn Leber, pedal steel player Rob Powell, vibraphonist Tommy Kesecker and members of Marin's Lighthouse Singers. Castro composed seven of the 10 pieces on "Phoenix." The opening track, "Beneath an Evening Sky," is by Oregon's Ralph Towner, one of the pioneers of new age jazz. The Lighthouse singers are featured on an innovative rendition of the traditional song "Amazing Grace." And an Apache double-wind flute player named Blue contributes a couple of deeply evocative tunes. The liner notes are laced with Castro's poetry, which could be precious, but works if you read the lines with the music in your ears. While some of the tracks settle into a nice soft jazz groove, others are moody and ethereal. They make me want to put the CD on and read Castro's poems over the music, which I may do this week on my Radio Liberatore Podcast. Lisa started out at Skywalker Ranch on the switchboard and got hired on with the seminal games division when it had just 45 employees. "When I left, it was 100 times that," she said. "I think I got hired on pure excitement and enthusiasm. It was work, but fun, learning about computer games. I fit right into that wacky world." 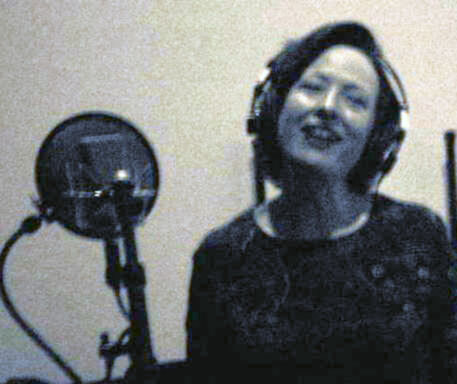 While at LucasArts, Lisa sang in Industrial Light & Magic's Noontime Band. She also writes songs and music for films in her home studio. But, more than anything else, the Marin music scene could use a good business head, and it looks as if she has one on her shoulders. Last year, she earned her professional certificate in music business from the Berklee School of Music in Boston. And she has all that Lucasfilm experience behind her. "I'm trying to apply what I extracted from that experience toward music," she said. "It was good training for what I'm up to now. Music is changing so much in how it's being sold and marketed." The Passion Star CDs are so well produced that they qualified for Grammy nomination consideration, quite an accomplishment for a brand new record label. "That was a great indicator that we were on the right path, " Lisa said. "It shows we achieved the level of production quality we were going for. It's been an amazing journey. I'm blown away by what we've accomplished. " Ray Cooper's piano music is very soothing and touching. It wraps around you like a cocoon and penetrates to the innermost depths of your soul. Really positive feelings are felt in Ray Cooper's "Tabernacle" album and he generously splashes them out. Ray Cooper's music will raise your spirits and open the expanse of your imagination.